Elianora has granted me permission to upload this modified .esp file. Elianora for Eli's Armour Collection Remade. Install with NMM, override when prompted. If installing manually, just drop the esp file on your data folder and overwrite when prompted. 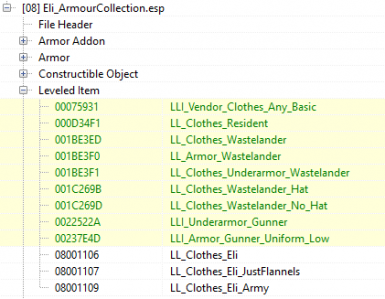 In FO4Edit, you just load all mods, right click the last one, select Other>Create Merged Patch, name the patch, wait for it, close the program, and then enable it in NMM. In Wrye Bash, open it, right click the Bashed Patch at the end of your load order, and select "Rebuild Bashed Patch", tick all your mods that you want to be in the patch in the window that pops up, and hit accept.